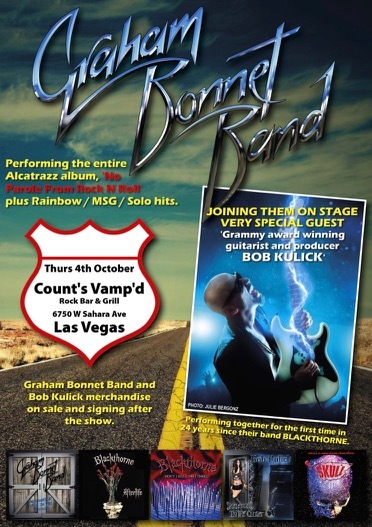 Legendary Grammy award winning guitarist and producer Bob Kulick will be making a guest appearance with the Graham Bonnet Band on October 4th at Vamp’d in Las Vegas. This will be the first time Graham, Jimmy Waldo and Bob Kulick have performed together since their band Blackthorne in the early 90’s. Also as a special event , Graham and his band will be performing Alcatrazz‘s No Parole From Rock N Roll album in it’s entirety. Graham, his band and Bob will be signing for the fans after Las Vegas show. This is sure to be a special night full of surprises.